Texas, for example, appears to have all the makings of a low-tax state. It has no personal income tax, no corporate income tax, no estate tax, and ranks 43rd in state and local tax collections as a share of personal income. And indeed, Texas is low-tax for the wealthy. According to ITEP’s analysis, only eight states tax their richest residents at a lower rate than Texas, where the top 1 percent of earners pay just 3.1 percent of their income in state and local tax. But at the very bottom of the income distribution, Texas’s “low tax” reputation couldn’t be farther from the truth. The poorest 20 percent of Texans devote 13 percent of their incomes to paying state and local taxes—including sales taxes, excise taxes, and property taxes, among other levies. This tax rate is high enough to earn Texas the dubious distinction of being tied with Arizona for the nation’s sixth highest effective tax rate on low-income earners. Texas’s decision to shun income and estate taxes in favor of high sales and property tax rates has effectively shifted the responsibility for funding government downward, onto the families least able to afford high tax rates. Unfortunately, however, Texas is not alone. Florida and Washington, both of which lack personal income taxes are ranked in the bottom half of states for their overall tax collections, are also among the states with the highest taxes on the poor. 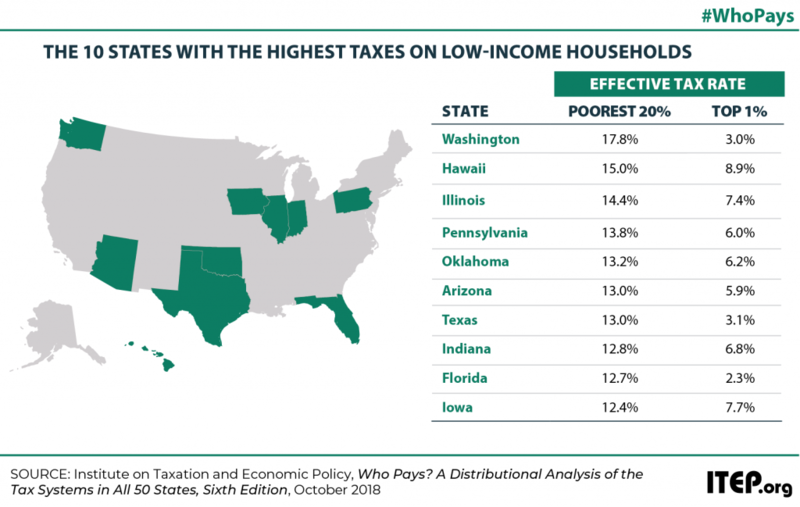 Arizona, Indiana, and Oklahoma levy comparatively low personal income taxes and have low tax collections overall, but their tax rates on the poor are also among the highest in the nation. Briefs outlining the results for all six of these states are available here. Arizona Florida Indiana Oklahoma Texas Washington Who Pays?